Two events this weekend at Christina Cultural Arts Center (CCAC) brings even more music to its intimate Clifford Brown Performance Space. 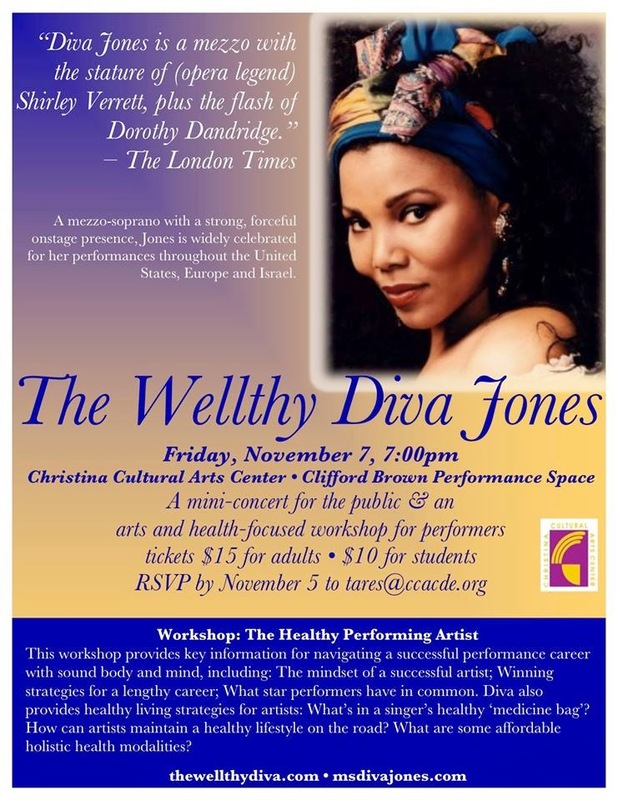 On Friday, November 7, beginning at 7:00pm, mezzo-soprano Diva Jones will present The Wellthy Diva Jones — a mini-concert for the public and a workshop focused on healthy-living for performing artists. Called "...a mezzo with the stature of (opera legend) Shirley Verrett, plus the flash of Dorothy Dandridge." by The London Times, Jones has performed throughout the United States, Europe, Israel, and United Kingdom with major orchestras, including the Los Angeles Philharmonic, the Israeli Philharmonic, the Philadelphia Orchestra, and the New York Philharmonic. She is also a dedicated whole and raw foods chef, who studied under the famed Ann Wigmore Institute. Tickets for Diva Jones are $15 for adults and $10 for students with ID. For more information on Diva Jones, visit msdivajones.com. 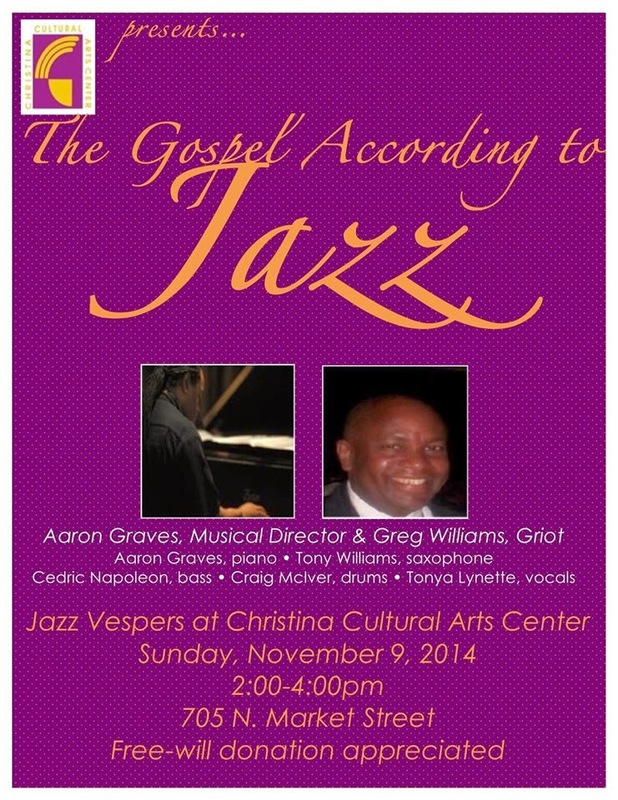 To close the weekend on Sunday, November 9, at 2:00pm, CCAC welcomes Music Director Aaron graves and griot Greg Williams for "The Gospel According to Jazz" Jazz Vespers. The program also features Aaron Graves, piano; Tony Williams, saxophone; Cedric Napoleon, bass; Craig Mciver, drums & Tonya Lynette, vocals. A free-will donation is appreciated. For more information on these events, please call Christina Cultural Arts Center at 302.652.0101. The mission of Christina Cultural Arts Center Inc. is to make affordable arts and education, workforce training and live performances accessible to youth and adults in a welcoming learning environment. Christina Cultural Arts Center Inc. was founded in 1945 by the Women's Club of Trinity Episcopal Church to provide activities for immigrant Polish and Swedish working-class families. In 1969, the Christina mission was re-aligned to serve as a community-based arts center with an emphasis on preserving African-American cultural heritage. In 1993, Christina completed a capital campaign to purchase and renovate its central location in downtown Wilmington at 705 N. Market Street. Today, Christina Cultural Arts Center Inc. is a gathering place for all, exploring diverse creative expression reflecting our shared American heritage. I like this place. I was here the other night, I've been there for about four or five hours and found the prices reasonable on all fronts and the staff to be so friendly. I would be the perfect person to have on an infomercial for this place for events in NYC if they ever had one. Mics Are Open All Over Wilmington!